EffectSizeFAQs.com provides plain English guidelines for interpreting the substantive or everyday significance of research results. The questions cover four related topics: effect sizes, statistical power, the interpretation of research results, and meta-analysis. In contrast with some Greek-filled, equation-laden texts, the material presented here was written for the 95% of us who aren’t statistics experts. Professor Paul Ellis is an award-winning author and researcher. He was born in New Zealand, lived briefly in the United States, completed his PhD in Australia, and taught research methods for 15 years at the Hong Kong Polytechnic University. His research interests include trade and investment issues, marketing and economic development, international entrepreneurship, and economic geography. He has been ranked as one of the world’s most prolific scholars in the field of international business. Click here to see his curriculum vitae. Ellis, P.D. (2010), “Effect Size FAQs,” website http://www.effectsizefaq.com, accessed on [insert access date here]. This is a wonderful resource! I have read many books that provide information on research and statistical methods but few that convey the concepts as clearly as this one, and fewer still that I can say I actually enjoyed reading. I would recommend it to those who are just starting to grapple with research methods as well as the more experienced researcher. Paul, Congratulations on a great site! It includes very useful computational tools that I hope many researchers will use before and after they conduct their studies. A great book! I was sufficiently impressed to offer to write a blurb, which you can read on the cover. 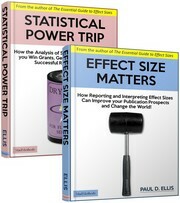 This stats reform business is serious, we all need to get into it, and Paul’s book is a terrific guide. My only picky point is that statistical power should really be superseded by precision–planning to achieve a target confidence interval width, tho’ we need better software tools to make it easy to do that. Once that’s easy, we won’t need all that stuff about power. Something to look forward to! Enjoy the book! Solely reporting statistical significance can result in misleading interpretations regarding the absolute and relative importance of significant relationships. This website is an invaluable resource for researchers to understand why and how to best apply the concept of effect sizes in their research. Good morning sir. Firstly I would like to thank you for the kindness and generosity in providing free access to statistics on your website and sharing your knowledge. My friend and I have both bought your book on Kindle and have found it very helpful. I am interested in conducting a research project and want to calculate the N for the study. I want to use change in likelihood ratios (LRs) as my effect size. I have an estimate of my control condition LR+ and LR- (1.29, 0.79). I also know my desired effect size in LR+ and LR- (2.48, 0.39). I want to calculate the N separately for a change in effect size from the control to treated LR+ and LR-, then use the larger of the two N.
I don’t know how to convert the change in LRs to something that can be used in most free power calculators. I have read there is a statistical calculator that will allow me to use LRs to calculate N assuming a power (0.8) and alpha (0.05). I have been scouring the internet and found several references citing a paper (Lyles, R. H., Lin, H.-M., & Williamson, J. M. (2007). A practical approach to computing power for generalized linear models with nominal, count, or ordinal responses. Statistics in Medicine, 26, 1632-1648.). I was hopeful you would be able to tell me which statistical program to use to calculate the two Ns using the desired change in effect size as determined by LRs. Your effect size websites are awesome. Do you know of a procedure to calculate the effect size of differences between two correlation coefficients? Thanks for the feedback. Since a correlation coefficient is an effect size, I would simply compare them directly. Effect size novice: Question about differences between Hedge’s g and Cohen’s d. When I use the calculator for Hedge’s g (with means, standard deviations and counts). The calculator computes a statistic for Cohen’s d and Hedge’s g. If they are about the same value, may I use either computation when reporting results. The reasons for selecting d over g or h are explained here. Really excellent website, dummy-proof info. I’ve used it to inform strategies to boost our recruitment rates and statistical power in a pilot feasibility study on managing alcohol problems in primary care. What a fabulous resource. I’ve pointed whatever readers I have to the site, with some comments about the whole issue.